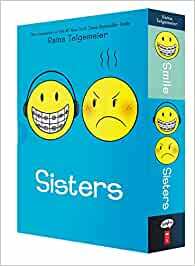 A special boxed set of the #1 New York Times bestselling and Eisner award-winning Smile and its companion, Sisters! Includes bonus stickers! In Smile, Raina just wants to be a normal sixth grader. But one night after Girl Scouts she trips and falls, severely injuring her two front teeth. What follows is a long and frustrating journey with on-again, off-again braces, surgery, headgear, and even a retainer with fake teeth attached. And on top of all that, there's still more to deal with: a major earthquake, boy confusion, and friends who turn out to be not so friendly. In Sisters, Raina can't wait to be a big sister. But once Amara is born, things aren't quite how she expected them to be. Amara is cute, but she's also a cranky, grouchy baby, and mostly prefers to play by herself. Their relationship doesn't improve much over the years. But when a baby brother enters the picture and later, when something doesn't seem right between their parents, they realize they must figure out how to get along. They are sisters, after all. RAINA TELGEMEIER is the creator of Smile, which is a #1 New York Times bestseller, winner of the Will Eisner Award for Best Publication for Teens, and a Boston Globe-Horn Book Honor Book. She is also the creator of Drama, which is a #1 New York Times bestseller and received a Stonewall Book Award Honor. Raina also adapted and illustrated The Baby-sitters Club graphic novels. She lives in Astoria, New York, with her husband, Dave Roman. To learn more, visit her online at www.goRaina.com. For my non book worm daughter 11, she will sit and read this book. So for me this was a bargain. It is like a comic to me. It was great value for money. Saying that my older daughter is a book worm and sits to read it for relaxing and pleasure. Very popular with my students. Fun and colourful books. Engaging and easy to read. Kids LOVE these books. I got them for them for Christmas, and they are 6 months new, well loved, with no signs of slowing down. Even my "I hate reading" kids reads them over and over. Which was exactly why I got them. I bought this bookset for my nine year old niece at Christmas. She absolutely loved it and devoured them both within a week. She told me that she really enjoyed them a lot. 5.0 out of 5 starsGreat gift! Bought as a gift for my niece and she loved them. My daughter loved the stories. He read them in a couple of days. Great service super fast shipping. Purchased books at a really great price!!! My little one is just about done both books and just loves them!!! !